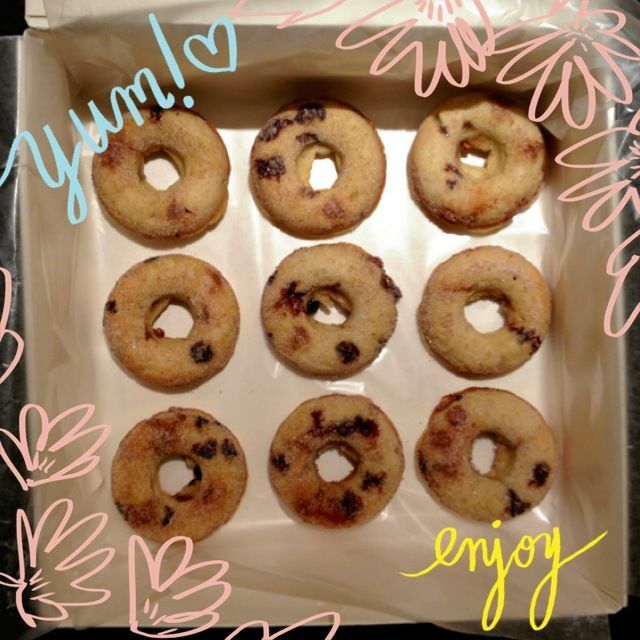 I was searching my pinterest board for some recipes for baked donuts and found this delicious and semi-healthy looking recipe. It looked super simple and I decided to give it a try and make my team at work my guinea pigs ;-) Lo and behold, I did not poison them and they did not spit/vomit it out and claim to have dysphagia, so I think these are a winner! Fun fact: Little did I know that it also happened to be National Donut Day when I shared these! My instincts just knew. I changed up the recipe a bit to what I thought would taste better and used ingredients that most people will find in their kitchens or at least are ingredients everyone would know how to find at a grocery store or at a neighbor's kitchen (do people still borrow ingredients from neighbors?). If you don't have a donut pan, I highly suggest the Wilton pans. You can find them at Bed Bath & Beyond (and use those coupons shamelessly) or Amazon for super cheap! Your local Marshalls/TJMaxx/Homegoods may also have these. Preheat your oven to 325F. Prepare you donut pan by spraying it lightly with EVOO spray. In a medium/large mixing bowl, mix together the mashed bananas, sugar and yogurt with an electric mixer. Add the melted butter, eggs and vanilla extract and mix well. Add the flour, ground nutmeg, baking powder, baking soda and salt. Do NOT overmix. Only mix until everything is incorporated. Use a spatula to fold in the peanut butter chips and chocolate chips. Use the spatula to transfer the mixture from the bowl into a large freezer ziploc bag. Squeeze out extra air and seal the bag. Use clean scissors to snip 1.5 cm off one of the bottom corners of the bag. Slowly pipe the mixture into your prepared donut pan, only filling it 3/4 of the way up. Pop the pan into the oven for 15 minutes. Mine took exactly 15 minutes to bake. While the donuts are in the oven, mix together cinnamon, brown and white sugars together in a bowl wide enough to fit a donut. Remove the donuts from the oven when they are ready. On a cooling rack or a large piece of foil. Flip the pan over to remove the donuts. Wait 5 minutes and then dip the donuts in the cinnamon mixture. 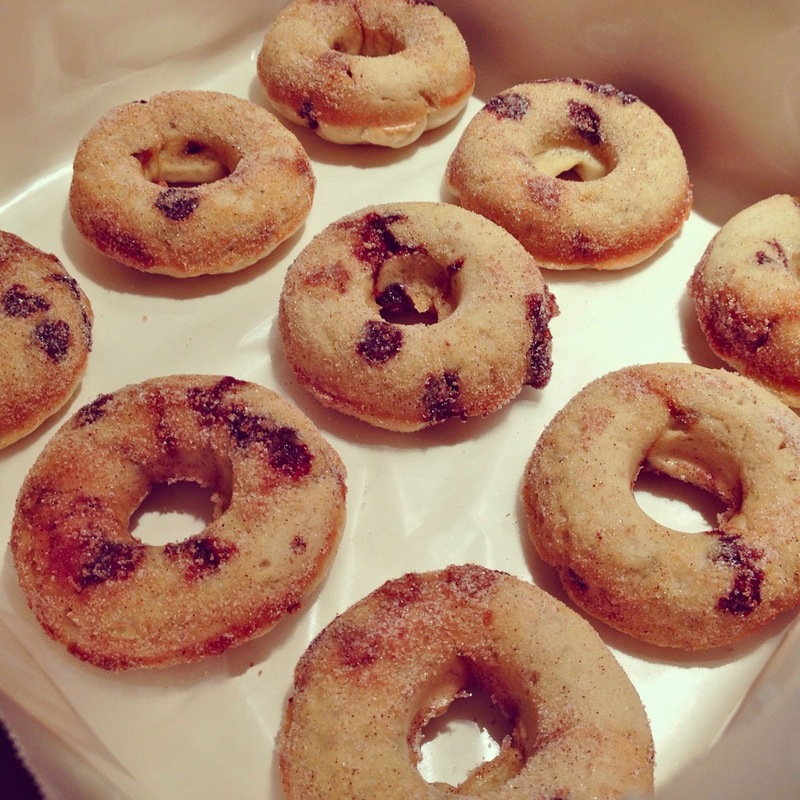 Set the donuts aside to finish cooling or enjoy them warm! Since I had to carry these to work, I used a gift box for clothes, lined it with wax paper/parchment paper, and placed the donuts inside like they do at donut shops :) Makes for a great presentation!